Film room this week looks at one of the rare bright spots on the 49ers defense this season, rookie middle linebacker Fred Warner. The 49ers have added a defensive lineman in the first round in three of the last four drafts and a defender with six of the last eight first round picks since the 2013 draft. Overall as a group, the defensive line rotation has performed admirably despite lacking a pass rush specialist off the edge. Instead, it has relied on middle and back end talent to supplant the need for a pass rush. Some of those players are already filling immediate needs yet the 49ers have found their next rising star, and it wasn't in the first round. The 49ers selected outside linebacker/nickel defender Fred Warner in the third round of the 2018 draft at pick 70. The outside linebacker served as a hybrid linebacker/safety-type player in the BYU defense. The pick puzzled a lot of folks, including me, as we'd never heard of him but his college tape is every bit as impressive as you'd think for a third round pick. In college he excelled in the passing game as a coverage defender, more than he did as a run defender. From that point of view, the pick made a ton of sense: if you can't build the pass rush you want right away, it makes sense to take players who can cover all areas of the field. With Warner, the 49ers got more than they bargained for though, as he's been one of the top run defenders in the league as well, with a 16.7% run stop percentage, tied for first among linebackers according to Pro Football Focus' Jeff Deeney. Warner flew under the radar in the preseason and garnered little attention but is quickly becoming a household name around the league as he quarterbacks a struggling 49ers defense. Warner began training camp as the third middle linebacker on the depth chart behind Reuben Foster and Brock Coyle. By week four of the preseason, he solidified his spot on the 53 man roster and sat out the game against the Chargers. In week one of the regular season, he was inserted into the starting lineup because of an injury to Malcolm Smith, and a suspension for Foster, but primarily for what he was able to do in the preseason with his snaps. Primarily known for his coverage skills, he inserted himself as force in the run defense. On this play, defensive end Solomon Thomas expertly two-gaps the offensive lineman to force the ball carrier back outside to the force defenders by playing the inside shoulder of the lineman. Warner takes on the block of the offensive lineman, establishes a strong base by taking outside leverage on the blocker and plays through his shoulder, effectively beating the block. Thomas' pursuit forces the running back into the lane for Warner to make the play as he fights through the block. Had he hesitated to read and react to the block and the running path, the ball carrier might have been able to break around the edge of the defense. Instead, Warner's instincts and athleticism would prevail. That same instinct and athleticism also enables him to beat blockers to the point of attack. On this play, Earl Mitchell, an incredible run stopper in his own right, eats the block of the left guard by working from the B-gap outside shoulder to the A-gap inside shoulder of the guard, allowing him to occupy both the guard and center. The left tackle to the same side works in tandem with the tight end to double team to defensive end Solomon Thomas. Combined with Mitchell's run fit into the A-gap, this creates a wide open B-gap for Warner to sneak through. As the blocks take shape, Warner is already moving through to his run fit assignment as the center chases him down. His instincts and athleticism to both read and react quickly to the run movement allow him to sneak through the gap untouched. Though the Vikings were without top NFL center Pat Elflein, it's safe to say even he wouldn't have been able to block on Warner. In college, Warner was the prototypical hybrid linebacker/nickel defender who could cover and cover well. His size and athleticism served him well in that role (as we'll later see), but it also served him well in the interior as he could seemingly chop down any blocker attempting to chop him down. On this play, the Vikings are running outside zone to the left. Some linebackers who don't share his traits automatically become liabilities behind their defensive line because there are almost no linemen who can really eat up the blockers on the zone run due to the nature of the blocking scheme. Warner defies this with his ability to read and react in space as the play develops. 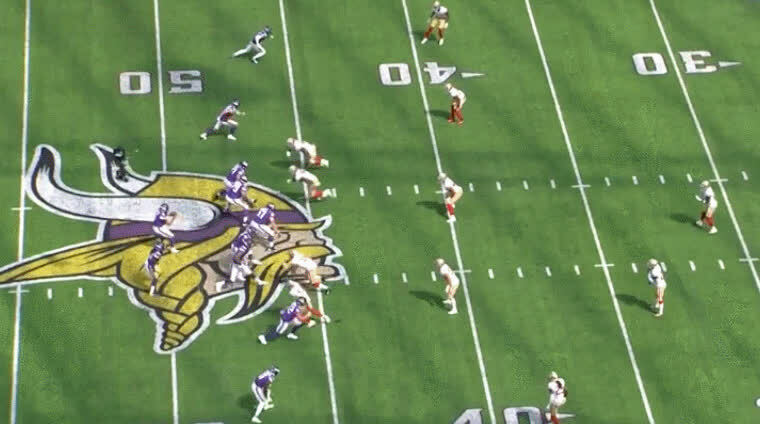 Here he instantly mirrors running back Dalvin Cook's running path when he sees the right guard gain depth up-field, indicating it's probably not a play action pass. The instinct to be a proactive rather than a reactive defender allows him to beat the block of the guard by using the guard's leverage against him and pushing him down to ground. Warner quickly regains his balance and joins several of his teammates on the run stop. Similar to the play above, Warner again mirrors the path of Cook on the outside zone. He shows off more of the lateral agility and balance needed to beat the blocker using his leverage against him. He meets Cook in the hole and wins yet another battle. Like the plays above, Warner is skilled at using the leverage of the defender against himself. As the play goes off, Mitchell is completely ridden out of the play by the double team on this inside zone run. This forces Warner into another situation where he has to repel the defender to have any chance at making a play. Had Mitchell fought off the double team, Warner would've had a free gap to shoot. As Mitchell is beaten, Warner's next instinct is to fight through the blocker and pinch his gap to force the runner outside. He does exactly that. Warner plants and uses a "wrong arm technique" against the left guard's inside shoulder with his up-field arm to squeeze the A-gap and minimize the surface area the blocker can use against him. This allows Warner to spin out of the grasp of the guard and spills Cook outside where Warner meets him. Had he approached this attack from any other angle on the blocker, he would've been a non-factor in the play as it likely goes for a bigger gain. Instead, he plants and creates a strong base to attack, spins out of the guard's grasp, and makes the play. Warner's instincts in the run also allow him to navigate through traffic to meet the ball carrier at the point of attack. This plays shows off Warner's ability to quickly diagnose plays and move fluidly downhill through the blockers to make tackles for a loss or a minimal gain. Warner's scouting report said he may be best utilized as a hybrid nickel corner/outside linebacker primarily due to issues locating the ball carrier and taking inconsistent tackling angles. However, both the play above against the Lions and this play against Vikings show he's developed the ability to run downhill and utilize his quickness and agility to make the necessary stop. Against the Vikings in particular, Warner takes advantage of Armstead's and Mitchell's trap of the right side of the offensive line and shoots into the open gap to tackle Cook, one of the speedier, quicker running backs in the league. The 49ers held the Vikings' running backs to 82 yards on the ground and the Lions running backs to 90 yards and Warner's run defense was huge reason why. Warner's role as a hybrid pass defender at BYU was his biggest strength and the trait most talked about as he entered the NFL draft last April. And it's easy to see why. He can change direction with relative ease while reading route concepts, doesn't overreact to receivers in his zone but instead often reads the quarterback's eyes and can jump routes in the time it takes the quarterback to decide to get the ball to a given receiver, and doesn't waste any motion or make any erratic movements when dropping into his zone coverage or when jumping a receiver's route. Warner makes his presence felt in all aspects of the pass defense whether or not the ball is thrown his way. When a receiver enters his zone, he shows no erratic movement and doesn't panic and jump a route early. On the two plays above, what he does instead is read the quarterback's eyes. Vikings quarterback Kirk Cousins scans the field during his progressions and ultimately comes back to the checkdown receiver who is running through Warner's hook zone in both cases. Warner is also going through the progressions with Cousins as he shows he is extremely responsive to where the quarterbacks are scanning. As soon as he sees that Cousins has to come off the checkdown, he breaks for the receiver before the ball is even in flight and comes up to make the tackle each time for a minimal gain. He gets the early jump on the receiver due to possessing a quick burst downhill due to his fluidity and lack of wasted motion. This kind of discipline and aggression cannot be taught. The 49ers also held Vikings tight end Kyle Rudolph to one catch for 11 yards. Warner was a big reason why. In addition to being a phenomenal downhill, break-on-the-ball defender, he arguably also excels in the more difficult task of pass defense while moving laterally. In this play, Warner does not seek to disrupt the route because he knows he can make a clean break on it if needed. Instead, he funnels Rudolph through his zone and stays square to the quarterback, never taking his eyes of both Cousins and Rudolph. The leverage he creates by allowing Rudolph to run underneath him is ideal as it allows him to keep funneling laterally with the tight end. If he bumps him, he risks taking a penalty and/or never recovering enough to cover Rudolph on the underneath crosser. Instead, his lateral movement allows him to gain leverage on the inside hip of the tight end, creating an extremely tight window for Cousins to throw into and allowing Warner to break-up the pass as it arrives. On a similar play against the Chiefs, due to his lateral footwork and explosiveness, he displayed great timing to attack the ball in flight while covering Kareem Hunt, one of the league's more explosive running backs. Warner also makes his presence felt even when the ball isn't thrown his way. On this play, The Vikings have the "spot" concept, a triangle stretch with a spot/curl route, a corner route, and a flat route, called to the right side of the formation with a trips bunch to the wide side of the field with Stephon Diggs running the curl route. Cousins sees that the corner route is covered and comes next down to the curl route by Diggs. Warner turns and looks toward Diggs' route, prompting Cousins to look elsewhere. By that time the pass rush gets to Cousins and forces him to scramble out of the pocket. Warner stays on Diggs until Cousins crosses the line of scrimmage where he then breaks on the quarterback. Cousins ultimately slides to avoid a big hit. Warner also showed up at key moments in the Vikings game to give his defense, and subsequently his offense, a chance to keep the game close. These two plays (above and the next play below) got the 49ers a key three-and-out to get the offense a chance to score in the 4th. The scouting reports on Warner didn't say much about his blitzing ability but he showed one possible way the 49ers could use him down the road. On this blitz above on Cousins, Warner shows off his range as he weaves through traffic and beats the block of Cook 13 yards in the backfield from his pre-snap spot. He disrupts the pass and almost stuffs Cousins, forcing Cousins to rush the throw and overthrowing deep to Adam Thielen. The play above set up this third down play, again highlighting Warner's safety-like range and ability to read and react decisively and quickly to the quarterback's eyes. Cousins looks to Thielen again coming across the middle but has to hurry the throw into a window being closed by Warner. He doesn't tip the pass but Cousins was forced to throw behind Thielen due to Warner's position. Thielen can't hold onto the pass but if Cousins had thrown in front of Thielen, Warner would've likely intercepted the pass and possibly for a touchdown. Not many middle linebackers can make this play in space. So far through three games, Warner seems to have earned the trust and confidence of the coaching staff to keep the middle linebacker spot and there is reason to be optimistic about the performance of the defense going forward. Getting Reuben Foster back should also bolster a much needed middle of the field defense that can lock down some of the league's best athletes in the coming weeks, though that wasn't the case against a Chiefs team that has athletes at literally every skill position on offense. Warner did his part in that game to lock down the middle of the field with Foster as the Chiefs routinely picked on the perimeter of the secondary. With Warner and Foster both capable of playing extremely well in space, the duo can and should be able to anchor an otherwise decent defense and take some of the pressure off of the defensive line by being able to provide critical run support and the secondary by providing needed pass coverage across the middle of the field. The only question that remains is have the 49ers found their next Patrick Willis/Navarro Bowman tandem? It sure seems like they're headed that way. Comment: He is getting there but missing tackles. Response: He’s missed 2 tackles in 3 games. Relax.